We provide complete fence design, collection, installation and repair services. Our professional fence design and installation will add privacy and beauty to your property. We design and install commercial fencing that provides the best long-term value for your property. We can restore your old wood deck or build a brand new one with quality materials. 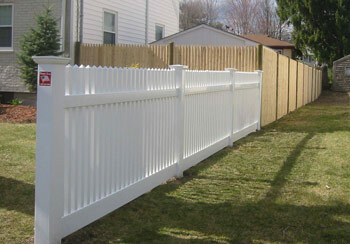 Patriot Fence Crafters excels at installing high quality, cost effective fencing. Patriot Fence Crafters is your local expert on fences that increase your home's security, appearance, and value at competitive prices. Additionally, we can help with decks and railing needs. We utilize a wide variety of top-quality materials to give you the exact look and feel you desire, and we even sell materials to our customers. Our fences are installed in a timely manner and are built to last! Every member of our staff is highly knowledgeable and dedicated to your complete satisfaction. We pride ourselves on our attention to detail and our care for our customers in the Greater Boston area. We know you'll be impressed with the outcome! Feel free to browse through all of our fencing services offered here at Patriot Fence Crafters and if there a fencing need that interests you, please don't hesitate to call us! Patriot Fence Crafters knows the value of a perfect fence. Whether you need to control access to your property, keep your pet close to home, maintain some privacy for your yard, or add an attractive element to your home or business, we have the solution for you! We install all kinds of fences from cedar, vinyl and chain link, to ornamental aluminum fences and wrought iron. In addition to our fencing services, we can also help with decks and railing requests. Please feel free to ask us any questions you might have. Here at Patriot Fence Crafters, we have the skills and tools necessary to give you a cost-efficient, attractive fence that suits your needs and tastes. We have ample experience in the industry, providing our customers with beautiful fences that perform! Our company is local, family owned and operated, and dedicated to providing exceptional customer service. We offer our fencing services to residents of the following cities: Andover, Beverly, Danvers, Ipswich, Lynn, Lynnfield, Manchester, Marblehead. Call us at 1-855-236-0978 or contact us online to schedule your no cost, no obligation estimate. We'll choose a time convenient for you! Come visit our showroom in Danvers - we're always open! Visit our outdoor display at 34 Endicott Street in Danvers, MA. We have a wide range of fence styles on display for residential and commercial applications. Feel free to visit us during normal business hours for design advice or for answers to questions about your project.